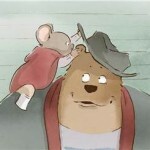 Ernest and Celestine is a enchanting fairy story of unusual friendship, loyalty and love between a tiny orphaned mouse and a very large grumpy bear. Both starving artists misunderstood, forced into loathed occupations and thrown together by chance. Captivating delicately-drawn characters come to life. The bear selling sweeties to school children while his wife offers dentistry across the street. The whole success of a mouse culture built on the sheer power of incisors. The ironies were many and the detail perfect. A drop of water and a dab of pigment conjured an intricate watercolour world. We need more children’s stories to cheer us. Whether you’re creating them for just one child or reach an audience of many like Ernest and Celestine, it matters not one jot. These tales unite us with their magical mysteries and the truths they gently teach us about ourselves.